Do you work at La Forchetta? What did you think of La Forchetta? A couple friends and I came here for dinner on a Sunday evening. Although it was snowing out there was still a steady stream of people coming through the door. Interestingly i noticed lots of Italian's actually dining. Front the get go, the staff came across as a friendly, helpful and tentative bunch. The house wine was only £11.50 for a bottle. The food was authentic and really a treat for the price. I had veal millanese which came with 3 large pieces of veal for just £12.50! The pizza's were hung of the plates and on average only cost £7. I could not believe the incredible value this place offers. A great big piece of homemade tiramisu was just £3.50 which rounded things up nicely. The decor is pretty dated but it's not that kind of place. Here it's all about authentic, tasty italian food for a fair price. The waitress' were all exceptional. I'm so glad i found this place and I'll be coming here regularly from now on. Also there's a great little italian bar/snack/live music place that's opened up downstairs run by a lovely Italian family. Well worth a visit after your meal. I have just got back from a Christmas dinner with my work colleagues. The meal was block booked a month previous. We were given a set Christmas menu to choose from. On arrival we were told the menu was not on offer due to the fact that it should have been pre booked. HELLO (See above) They said they had made a phone call to see what we wanted to order but did not get a reply. Do you not think that it was a priority for the restaurant to pursue this? Some of us, me included were offered the menu we wanted. The others had to settle for another option. They did and chose a much cheaper plate. The waiter said it was all a miss understanding. It was however quite clear someone did not do the job or did not want to do their job. 1, They could have sold a lot more food on the night. 2, We were located in the coldest part of the space even though it was not that busy 3, I beleive the Chef did not want to cook anything on the night. How do i know this. We were offered any sweet off the menu other than what was on the Christmas menu, even though some of us were told we could have what was on the Christmas menu. Why, because it was a pre prepared set choice. 4, I was not even offered a discount on my set menu even though the sweet stated was not on the menu. 5, The service was disgraceful in the way we were treated, I went up to pay individually for myself and recieved a pert reply of 'Its on the table' I must state in defence that there was one female waitress who did her very best to placate the situation. They do not deserve her. I was with a group so was obliged to stay. I would have walked out otherwise. The dishes are huge, the prices low and the food authentic at this popular East London Italian. You can’t miss this huge restaurant a few minutes walk from Bethnal Green tube. 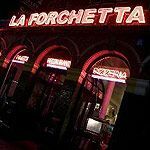 There’s a large neon light spelling La Forchetta outside, as well as four huge red yellow and green arches on the front, which stand out from the much less glitzy shops that neighbour it. Inside, you’ll be taken aback by both the size of the place – there are two floors (downstairs is good to book out for big groups) - and the general 1980s feel that comes from somewhere that's genuinely dated, rather than anything more fashionable. The massive dining area is covered in tables with chequered cloths parked between big white pillars with plants, lit by outdoor lights and brightened up by retro pastel artwork on the walls. And when you enter the white-tiled toilets, you’ll really feel as if you’ve stepped back in time. One particularly good feature is the big boat, hanging from the wall at the back. There’s also a television at the rear of the restaurant, which flips between sports channels and whatever the staff fancy putting on while it’s quiet. Young East London hipsters and budget-conscious East End natives are attracted by the low menu prices and unpretentious feel. Love ballads from the '80s play in the background and this adds to the dated atmosphere. Staff are attentive, friendly and willing to chat, which the locals love. It's authentic and unbelievably good value for money, as the portions are huge. Staff are also honest about the sizes of their dishes and refuse to let you over order so you’re not wasting food. Starters are priced from £3.50, pizza and pasta dishes start at £5.70, and main courses start at just over a tenner. There's also a variety of deals, including lunchtime ones where you can buy a main course and get a soft drink for free. The pane di pizza all’agilo (garlic bread – £3.50) either comes as it is, or you can have a topping of tomatoes or mozzarella for the same price. It’s the size of a small to medium pizza – so ideal to share. The dough is well cooked, so it’s soft and easy to tear away, while also being slighty browned underneath. It’s well favoured with garlic, but not over pungent to the point of being anti-social. If you choose mozzarella, you get a delicious, generous bubbling coat of melted cheese on top of the garlic. The insalata tricolore (£5.20) is one of the pricier starters, but still excellent value, and is also an ideal sharing starter or side. Served on a large plate, you get three strips of a sliced, soft and creamy avacado, fresh and juicy beef tomato and milky buffalo mozzarella, all generously drizzled with basil-infused olive oil, which works perfectly. Pizzas make the ideal main course and are massive, so great to share, especially if you team them with a salad or a couple of sides. The Fiorentina pizza (£6.50) is delicious. Like the garlic bread, the dough base is soft, yet nicely browned underneath. The egg in the centre is slightly runny and this gently flavours the fresh and plentiful spinach, evenly-spread tomato sauce and the generous sprinkling of grated mozzarella cheese. The vibrant-tasting olives are a great addition too. When it comes to the nineteen desserts on offer, British favourites such as chocolate profiteroles, fudge cake and banoffee pie, sit alongside Italian classics, including panacotta, casata and cheesecake, so there’s something to please everyone. These are reasonably priced. House wine is £9.80 (£2.70 for a small glass, £5.50 for large) or for a better-quality Italian bottle, such as Valpolicella, you’re looking at paying no more than £20. The house red is easy to drink though, and goes well with most dishes. Imported beers include Italian favourites like Peroni, and they start at just under £3 a bottle. There’s also a good selection of liquors, priced from £2.50 a shot. If you care less about the surroundings and more about the food, this place is somewhere you have to try.